Remedy the uncertainty of knowing there’s a problem in your pipes, but not knowing what the best solution is, with the innovative sewer camera inspections provided by our team at NuFlow St. Louis. For our customers in Town and Country, we strive to alleviate their doubts and ensure that our solutions are practical and completely effective through the services we have proudly invested in. Our team of experts understands that older homes built within the past forty years are under the greatest risk of pipeline complications, and we treat them as such, offering eco-friendly services that won’t result in any additional damage while ensuring that our work is comprehensive and affordable. 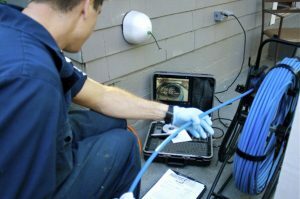 Our sewer camera inspections are available for all types of homes regardless of their age, as regular maintenance can prevent problems such as leaks, fractures, and collapses from plaguing your pipeline systems, and our sewer camera inspections have the capability of easily exposing these problems so that we can recommend the best solutions. We work with our customers to offer the best solutions, regardless of their budget. Our prices are unbeatable and affordable, and with our sewer camera inspections, we ensure that you won’t need to pay for more services than necessary during our visit. We don’t’ use invasive, potentially damaging methods to complete ur sewer camera inspections, and we pride ourselves on the fact that our process is very non-invasive and customer-friendly. We rely on pre-established entry points like drain cleanouts and insert a small, flexible rod with a camera attached at the end into your pipes. The footage captured by the camera is of the highest quality and is fed back to a monitor for our technicians to view for reference. We assess the condition of your pipes through this inspection, and by doing so, we can identify issues, small or large, immediately. Our technicians are always prepared to offer the best solutions for any issues encountered, including leaks, corrosion, and even pipeline collapses. Our sewer camera inspections are a vital step in our process, so much so that we offer this service in all of our work, including drain cleaning, pipe repair, and sewer line repair services. Why Choose NuFlow for your Plumbing Needs? We have created technologies unique to our company from the very beginning, and we place a strong emphasis on creating strong relationships with all of our customers. We strive to make our customers comfortable with our work and ensure that the results are trustworthy and long-lasting. We provide you with accurate information backed up by what we see on the screen we present to you. We’re willing to discuss solutions that you think will work best for you, and we offer maintenance programs like monthly or yearly drain cleaning to keep your pipelines continually running smoothly. At NuFlow St. Louis, we have over fifteen years of experience in the industry, and we have been employing the most advanced technology in the market since 2000. We are proud to invest in trenchless technologies that allow us to improve our work ethic and customer satisfaction. When you need assistance and require a sewer camera inspection in Town and Country, look no further than NuFlow St. Louis for all of your pipeline questions and concerns.